A photograph of the Topeka Owls baseball, an American minor league team, in Topeka, Kansas. 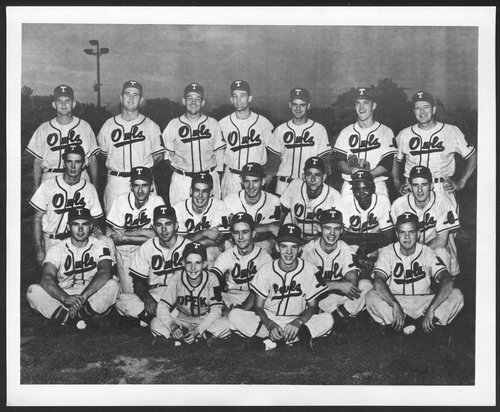 In 1953, the Owls were affiliated with the Chicago White Sox. Players in the photograph are identified as top row (left to right) Darrell Lindley, Ellis Daugherty, Gene Smith, Clive Follmer, Bob Drefs, Bob Lowe, Ira Hutchison (manager); second row Randy Lewis, Jack Dean, Art Vigare, Bob Walz, Joe Jaworski, Alfredo Ibanez, John Gugala; front row Roland Alexander, Clyde Berry, Mel Lightner, Tom Pritchard, Ray Baer, and batboys Kenny Marquart and Dennis Michael.